Porous nickel oxide (NiO) and zinc oxide (ZnO) submicro- and nanofibers were synthesized by impregnating electrospun polyacrylonitrile (PAN) fiber templates with corresponding metal nitrate aqueous solutions and subsequent calcination. The diameter of the NiO and ZnO fibers was closely related to that of the template fibers and larger diameters were obtained when using the template fibers with larger diameter. SEM results showed that the NiO and ZnO fibers have a large amount of pores with diameters ranging from 5 nm to 20 nm and 50 nm to 100 nm, respectively. 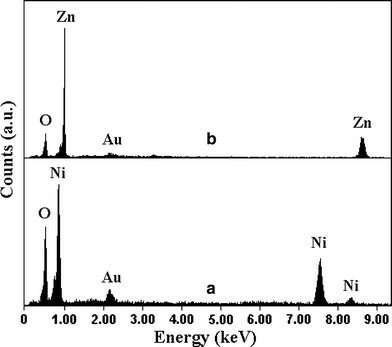 Energy dispersive X-ray (EDX) spectra and X-ray diffraction (XRD) patterns testified that the obtained materials were NiO and ZnO with high purity. Porous materials with high specific surface area (SSA) are highly required for applications in catalysis, supercapacitors, electromechanical actuators, and bio- and environmental engineering [1–4]. Nanomaterials in the dimension range of 1 to 100 nm have received considerable interest because of the unique properties different from their bulk counterparts. Porous nanomaterials have attracted much attention in recent years due to their hierarchical nanostructures [5–9]. Nickel oxide (NiO) is an important material extensively used in catalysis, battery cathodes, gas sensors, electrochromic films, magnetic materials, and photovoltaic device [10–15]. Improvement of the SSA of NiO nanomaterials can greatly enhance their applications especially for catalysts and supercapacitors [16–18]. Another oxide material studied here is zinc oxide (ZnO), which is a metal oxide semiconductor with wide bandgap of 3.37 eV and high exciton binding energy of 60 meV, and it possesses unique optical, acoustical, and electronic properties that stimulate wide research interest in blue light-emitting diodes (LEDs), field-effect transistors (FET), ultraviolet laser diodes (LD), chemical sensors, acousto-electrical devices, catalysts, and dye-sensitized solar cells [19–22]. Increase of the SSA of ZnO nanomaterials benefits the improvement of its optical property  and sensing response , etc. In this work, we developed a novel approach to synthesize porous NiO and ZnO submicro- and nanofibers by impregnating electrospun polyacrylonitrile (PAN) fiber templates with corresponding nitrates aqueous solution and subsequent calcination. This method is very simple and possibly applicable for preparing porous submicro- and nanofibers of other metal oxide materials. Polyacrylonitrile (PAN,Mw = 150,000) purchased from Aldrich was used to prepare the fiber templates. The electrospinning solutions were prepared by dissolving PAN in dimethylformamide (DMF) solvent at the mass concentration of 11 and 14%. The electrospinning process was carried out at the voltage of 20 kV, where aluminum foils were used as the collectors. The collected PAN fibers were pretreated at 250 °C for 2 h in air for stabilization. About 50 mg stabilized PAN fiber templates were impregnated with 10 mL Ni(NO3)2or Zn(NO3)2aqueous solution at desired concentrations. Then the samples were impregnated with 10 mL 0.1 M ammonia solution. After drying in air, the samples were heated from room temperature to 700 °C in air at a heating rate of 10 K/min and maintained for 1 h in air. X-ray diffraction (XRD) pattern was recorded with a XD–2 diffractometer (Beijing Purkinje General Instrument Co., Ltd.) to identify the phase of the samples. The morphological features of the samples were characterized with a HITACHI S-4700 scanning electron microscopy (SEM), and their components were determined by an energy dispersion X-ray spectroscope (EDX) (EDAX company) equipped in the SEM system. 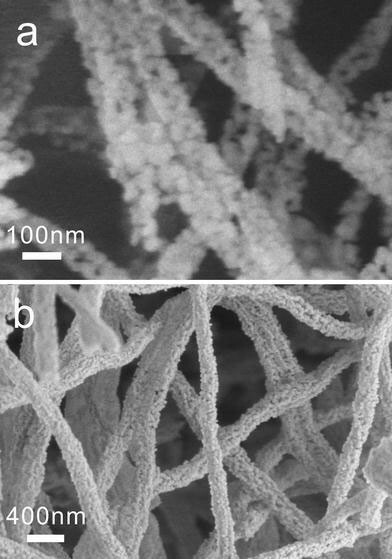 Figure 1 shows the SEM images of the electrospun PAN fibers prepared at the solution concentrations of 11 and 14%. The diameter of the PAN fibers is strongly dependant on the solution concentration with it in the range of 310–410 nm (Fig. 1a) at the former concentration and 850–1050 nm (Fig. 1b) at the latter concentration. The diameter increase of the electrospun fibers with solution concentration is due to the resultant increase in solution viscosity, which has been repeatedly reported previously [25, 26]. Figure 2gives the SEM images of the NiO (a–c) and ZnO (d–f) products at different magnifications. Both products exhibit fibrous morphology. The diameter of the NiO and ZnO fibers ranges from 80 to 130 nm and 400 to 750 nm, respectively. The template fibers used for preparing the NiO and ZnO fibers were electrospun at the solution concentrations of 11 and 14%, respectively. As the above stated, the PAN fibers electrospun at the concentration of 11% is much smaller than that electrospun at 14% (Fig. 1). So the diameter difference of the NiO and ZnO fibers originates from that of their respective template fibers. It is observed that the NiO nanofibers are composed of many nanoparticles with diameter in the range of 20 to 35 nm, and the ZnO submicrofibers are composed of many nanocrystallites with a width of about 65 nm and length of about 200 nm. Interestingly, both the NiO and ZnO fibers exhibit porous morphology with pore size in the range of 20 to 35 nm for the former and 50 to 100 nm for the later (Fig. 2). Besides the diameter of the PAN template fibers, the concentration of the impregnating solutions (Ni(NO3)2and Zn(NO3)2) is also important in affecting the diameter of the product fibers. Different concentrations of 0.6, 1.0, and 3.0% for the nickel nitrate solutions were investigated for preparing the NiO fibers, where the PAN fibers prepared at the PAN/DMF solution concentration of 11% were used as the templates. The SEM images of these three samples are shown in Figs. 3a,2a–c, and3b, respectively. With decreasing the concentration of the nickel nitrate solution from 3.0% to 0.6%, the diameter of the NiO nanofibers decreases from about 210 to about 80 nm, while the pores in the NiO nanofibers show no obvious changes. Figure 4 shows the typical EDX spectra of the NiO and ZnO fibers. 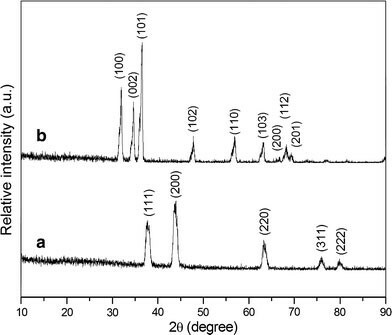 For the spectrum of the NiO fibers only nickel and oxygen were observed (Fig. 4a) and for the ZnO fibers only zinc and oxygen were observed (Fig. 4b). Furthermore, the atomic ratios of nickel/oxygen in the NiO fibers and zinc/oxygen in the ZnO fibers are near to the theoretical ratio of NiO and ZnO of 1:1. The XRD patterns of the NiO and ZnO fibers are presented in Fig. 5a and b, respectively. The well-defined diffraction peaks at about 37.6, 43.7, 63.4, 75.7, and 79.8° are observed in Fig. 5a, corresponding to the (111), (200), (220), (311), and (222) planes of cubic NiO crystals , respectively. The peak positions of the XRD pattern of the ZnO fibers (Fig. 5b) are in good agreement with those of the hexagonal ZnO with lattice constants a = 0.3250 nm and c = 0.5207 nm . The above EDX and XRD results testify that the obtained products are NiO and ZnO with high purity, respectively. Many literatures reported that the products with tubular structures could be obtained when calcinating the polymer fiber templates coated with a shell layer of inorganic precursors [28, 29]. However, some researchers also pointed out that the shell layer of the inorganic precursors would shrink or collapse if the process of removing the templates could not be well controlled . The phenomenon of shrinkage of the shell layers without forming tubular structures provides us a simple and easy approach to fabricate fibrous materials. The reason for the formation of the NiO and ZnO fibers rather than tubes mainly lies in that the precursor NiO and ZnO shell layers coated on the surface of the PAN template fibers shrink accompanying with the removal of the PAN fibers maybe driven by external pressure and the cohesion between the nanoparticles. To promote the shrinkage of the shell layers, low concentration of nitrate precursor solution and high temperature heating rate were adopted. The adoption of low concentration of precursor solution results in the small thickness of the coating layer and thus low self-supporting strength. In this case the shell layers are prone to shrink under external pressure during removal of the core templates. The adoption of high heating rate of 10 K/min results in rapid oxidation of the PAN fiber templates and release of a large amount of gases during short time, which generates certain pressure difference between the exterior and interior of the fibers. If this pressure difference is higher than the critical pressure beyond which the shell loses its stability, the shell layer would shrink , and thus products with solid structure are obtained. The PAN fiber templates were removed through decomposition, carbonization, and oxidation due to reaction with O2 in air , which generated a large amount of gas products. The release of these gases from the core of the impregnated fibers to the outside could produce a large number of pores in the residual materials [33, 34]. 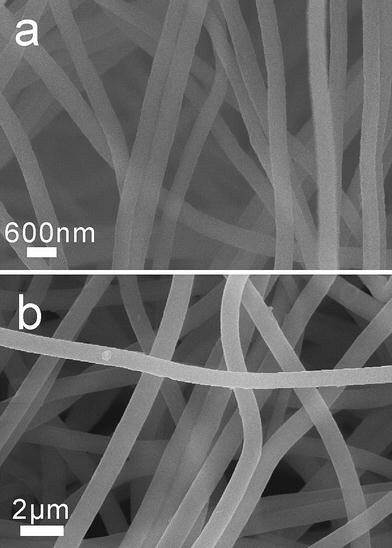 Although using the same amount of nickel nitrate and zinc nitrate precursors, the NiO fibers have much smaller diameter than the ZnO fibers (Fig. 2), strongly suggesting that the structure of the ZnO fibers is less compact. This is in agreement with the observation that the pore size of ZnO fibers is larger. Furthermore, the more porous structure of ZnO fibers results in their poorer mechanical strength, and thus the ZnO fibers are prone to break. Therefore, it is vital to carefully control the procedure of removing the polymer fiber templates for fabricating long, continuous, and porous metal oxide submicro- and nanofibers. In conclusion, porous NiO and ZnO submicro- and nanofibers were prepared by using electrospun polyacrylonitrile fibers as templates. The products were obtained by impregnating the electrospun fibrous webs with nickel and zinc nitrate aqueous solution followed by calcination in air. The diameter of the NiO and ZnO fibers is strongly dependant on that of the template fibers and tends to be larger when using the templates with larger diameter. SEM showed that the NiO and ZnO fibers have many pores with diameter in the ranges of 5 to 20 nm and 50 to 100 nm, respectively. The EDX and XRD results testified that the obtained products are NiO and ZnO with high purity. We expect that the procedure of removing the polymer template fibers play key roles in the structure formation of the products. This method is very simple and possibly applicable for preparing porous submicro- and nanofibers of other oxide materials. This work was supported by the NSFC (Grant No. 50572019), Program for New Century Excellent Talents in University (NCET), SRF for ROCS, SEM, and S&T Program of Shenzhen government.